Monitoring and Statistics are available since version 1.1.2.0. This page is not available in the user respective admin menu. You can reach the page while simply going to http://search.yourdomain.local/PRTGMonitoring. As the name indicates, this page was optimized to be used with Paessler PRTG. Any user could go to the page, there are no restrictions, while the link is kind of hidden of course. The only real restriction is that the user has to be authenticated against the web server with NTLM credentials. As for now this is only optimized to be used with Paessler PRTG, meaning you could use a simple HTTP Data Advanced sensor to access the page. The content it self is a simple XML formatted output that is PRTG conform. 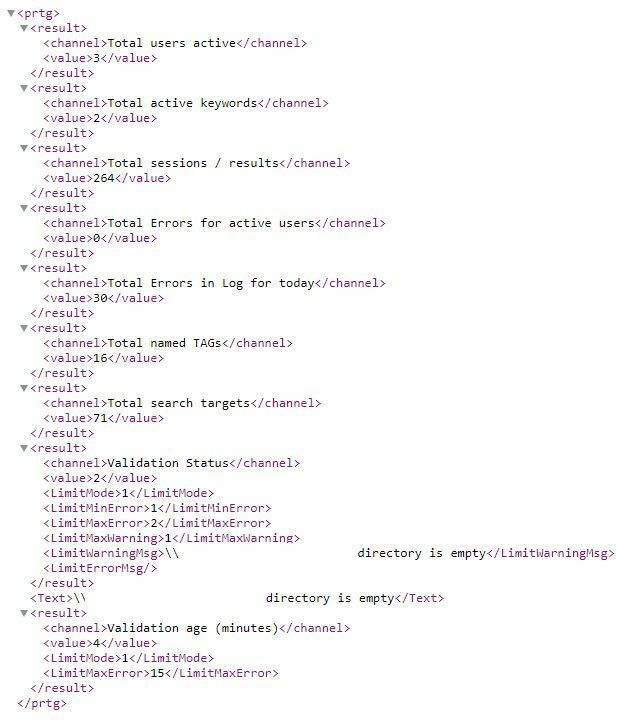 Other monitoring solutions that don’t accept this specific format would need to use some kind of script that reads and adjust the XML content to something that the target solution understands. Of course, you could also contact me and let me know what format you need and we see what can be done about it. The monitoring and statistics page as well does a auto validation of your search targets when the page is accessed. The interval for this is configurable on the application configuration page. If the interval is passed, the page will cause a validation before the content is shown. Depending on your configuration this can take several seconds. Since it is optimized for PRTG there is an defined channel limit configuration that will cause PRTG to go in to warning or error mode for the sensor. If this is the case, there is additional information shown in the sensor that indicates the issue with the configuration. Per default the interval is set to every 24 hours. The validation will only automatically executed when the Monitoring and Statistics page is accessed. Having said this, if you do a manual validation on the configuration page, it will influence the interval – only the last validation data is kept. As for the additional information shown in regards to the keywords, user sessions, etc.. none of this information in saved in any way. This is read directly from the RAM respective in memory objects of the application. The time of a session life time depends on the configuration of your web server. This should be 20 minutes by default. There are various automatic clean up processes that try to eliminate active objects rather pro active in the code. I do not suggest to lower the session timeout configuration in your IIS.